Spring cleaning is not only for our external environment but also great time to clean out our bodies as well. Here are some great ways to detox your skin and pull toxins out of your body, and increase lymphatic function. Did you know our skin breaths? When skin is clogged with dead cells, it is operating far below its capacity to remove toxins and waste that is excreted through perspiration. Purchase your DRY BRUSH here! 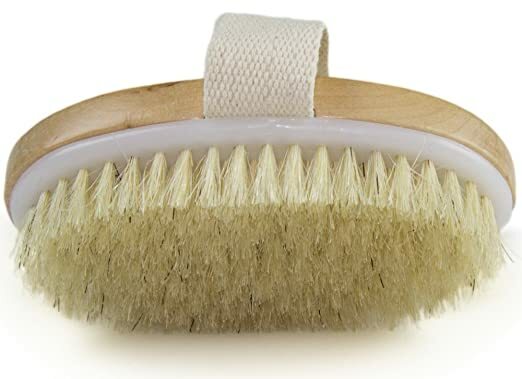 Dry brushing helps stimulate your lymphatic system, increasing your circulation, exfoliates your skin and offers both invigoration and stress relieving. HOW TO DRY BRUSH: Using a soft, dry brush. It is important to always brush towards the heart. Start brushing from feet moving up legs and tummy, now from fingers to arms brushing up towards heart. When brushing face and shoulders gently brush down to heart.. Now shower using any of our GOAT MILK SOAPS! Bentonite clay is a swelling clay and when it is mixed in water it rapidly swells and opens like a highly porous sponge. The toxins are drawn into the "sponge" through electrical attraction and bound, to be removed from the body. How cool is that? Of course adding flowers is always beneficial to the soul! You can get all the ingredients, except the Bentonite clay and Food Grade Hydrogen Peroxide, at the grocery store. But I provided a links with each ingredient. To ORDER INGREDIENTS click individually the ingredients and it will take you to a link to similar product to what I use. (This blog is part of the Amazon affiliate program and receives a percentage of each sale made from the links) THANK YOU FOR YOUR SUPPORT!